Set after the attack on New York, Thor is busy restoring order within the Nine Realms whilst the Bifrost is being reconstructed. Having not seen Thor for two years, Jane Foster strives to find scientific anomalies which are similar to the time they found Thor in New Mexico. As a result of the convergence, a rare alignment of the Nine Realms, Foster is sucked into a portal which links these Realms together. She is teleported to a new world and gets infected by the Aether. A group of Dark elves awake once they feel the Aether’s release, the same dark elves who attempted to take over the Nine Realms using the same weapon. There’s a moment during the film’s opening where we first see Thor appear, and that’s the moment where Chris Hemsworth truly feels like Thor. In the past two films he’s been in, he never really became anything more than an actor playing this character, but after this film it feels as if no one else could play this role but him. From that moment onward’s I felt pumped to be watching a Thor film. This sequel is better than the first in many ways but it doesn’t feel as whole as it could have been. Firstly the improved CGI makes this film visually stunning as we get to see Asgard in more detail. It’s colourfully glossy which gives it that genuine comic book aesthetic. There’s a lot more emphasis on costume and set design. Thor’s costume looks polished and pristine, which no longer feels gimmicky. Asgard and the Nine Realms actually feel real now which reflects Jane Foster’s feelings as she follows Thor to Asgard for the first time. It also feels a lot more like a Thor film, even though the Aether is a part of something Avengers related. The first film was an origin story but it was also as much an Avengers prequel. 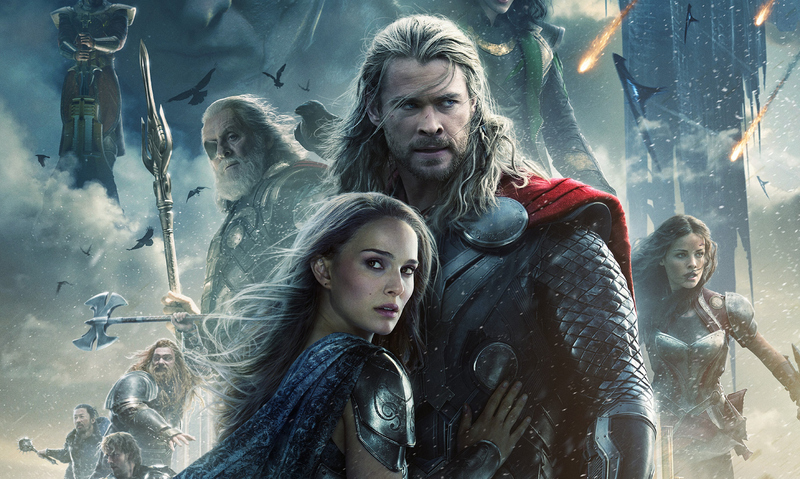 Thor: The Dark World has a much more interesting story driven by fantasy stories and fairy tale inspired characters. What I like about these Marvel films is that they all offer something different. Iron Man is pure comic book action, Captain America is a lot more political and Thor feels like Lord of The Rings in terms of the fantasy elements. In terms of the film not feeling whole, I think what tarnished its potential is the fact that there’s too many characters which get such small screen time. Thor has an awesome group of warriors he fights with yet we hardly see them. I don’t know if the comics are the same way, if so fair enough, but I wanna see more of them. Maybe their teasing us for whats to come in the third Thor film, but there is definitely going to be some love triangle forming soon. It might have been hard incorporating it in this film but it was disappointing not seeing just a little bit of it. It’s going to be interesting to see how Sif and Jane Foster face off. The theme that felt evident is inconsistency. When intended to be funny it was, but the jokes either come at inappropriate times (Thor getting on the tube) or don’t happen for long periods of time during more mellow scenes. Same goes for the tone, once scenes transition between Earth and Asgard there’s definitely a tonal change. Once at earth, the music is more comedic and light hearted which contrasts the dramatic orchestral music when in Asgard. It makes sense as it gives these locations different identities but the film was either funny at one point then dramatic in others. The major highlight though is Loki, who Tom Hiddleston continues to play to perfection. It’s different seeing a villain stick around for once, and a villain that most people like, even if he is completely evil. Once Thor and Loki eventually team up, the film kicks into gear and it starts feeling like a Marvel film. Your Fix for Everything Film.